One of my favorite things on a cold wintery day is warming up with a big hot bowl of homemade soup. Chicken Noodle soup is one that always hits the spot! 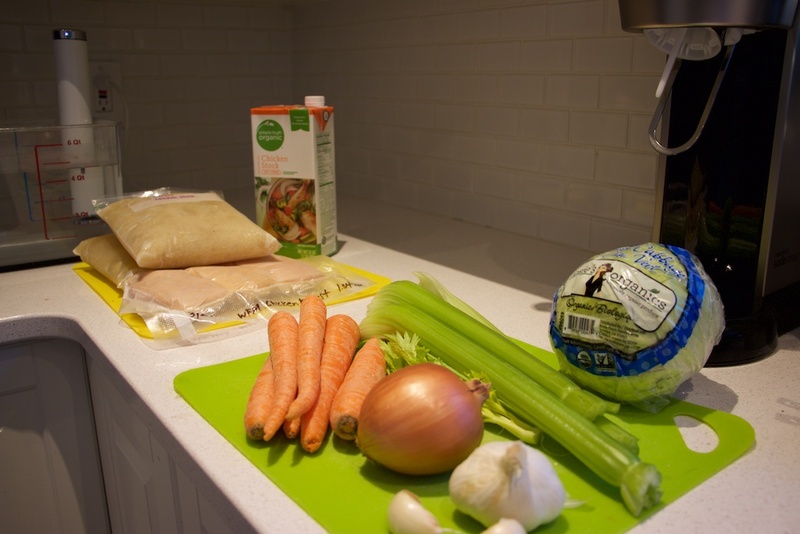 Today, I have my recipe for my Chicken No-Noodle Soup that I would like to share. 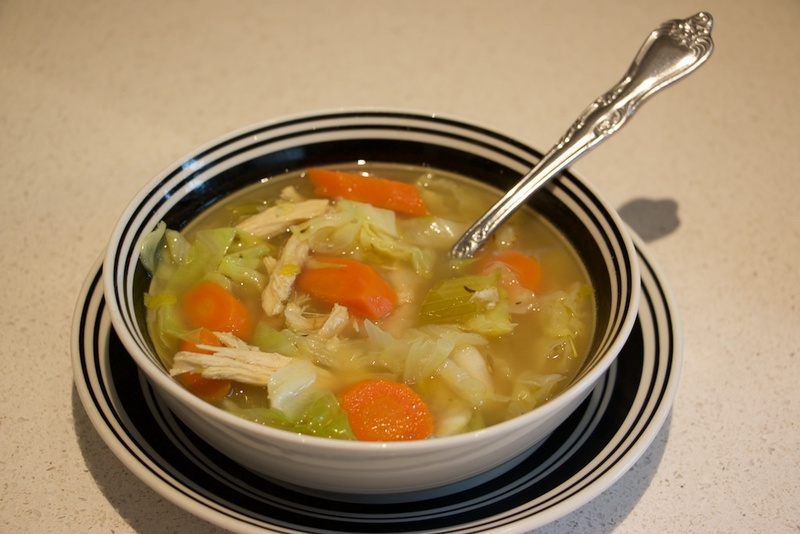 This recipe is a low carb and gluten free way to enjoy Chicken Noodle Soup without missing the noodles—the secret is a simple substitution of cabbage ribbons for the noodles! This is a recipe that I have made many times. I do not personally follow a gluten free diet, but I do occasionally want to indulge in great food without a carb coma following. I came across the idea of using cabbage in place of noodles several years ago. I had been seeking a way to use cabbage in a tomato based vegetable soup trying to emulate a recipe I remember my grandma making when I was growing up. I don’t remember if I ever had success with that recipe mission, but from those past searches, the cabbage noodle was born! It ensures I have all of the necessary ingredients in the appropriate quantities for the recipe prepared for use. I cannot tell you how many times I start making something only to realize half way in I don’t have enough butter! This also allows me to start cooking in a calm and organized manner because I know I will not have to frantically search for anything mid recipe. 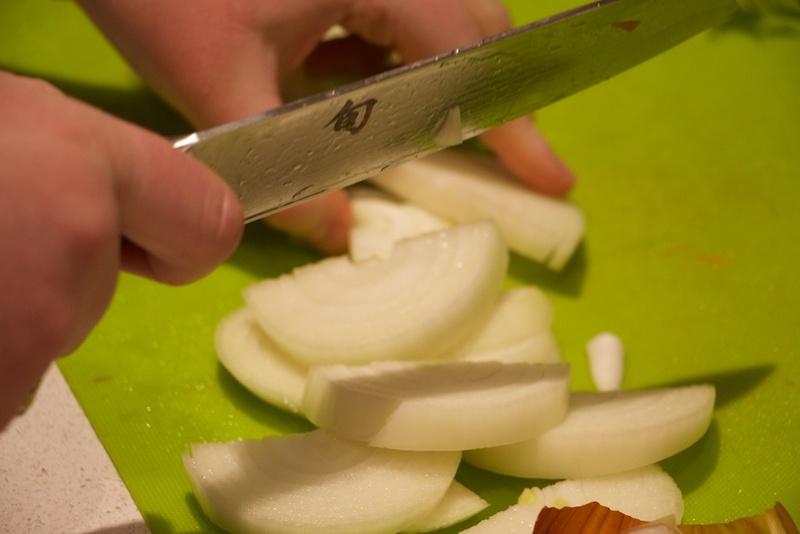 Cooking can be fun and easy with a little upfront prep! 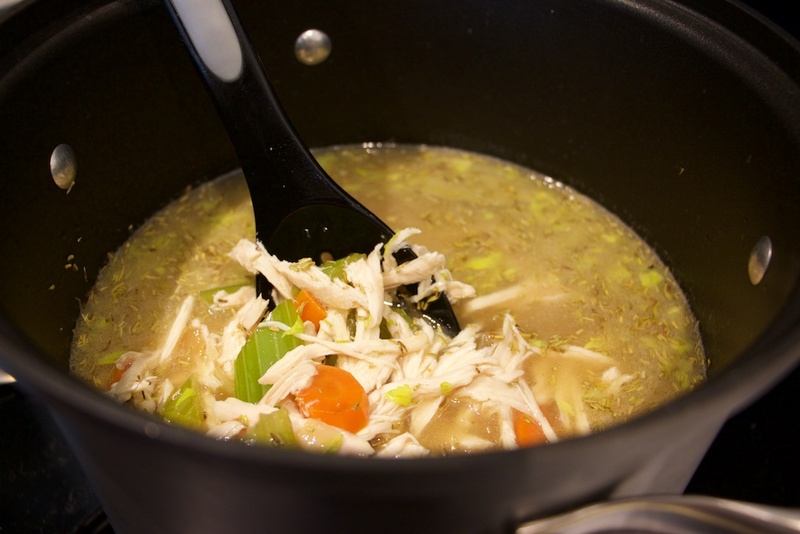 A great batch of chicken soup can be started with either yesterdays leftover roast chicken or todays freshly prepared chicken. If you have leftovers, this is a great use up recipe for your chicken! I would suggest using between a fourth and a half of the whole chicken (light or dark meat both work). Today I did not have any leftover chicken, so I have prepared three chicken breasts, or about 1.25 pounds. 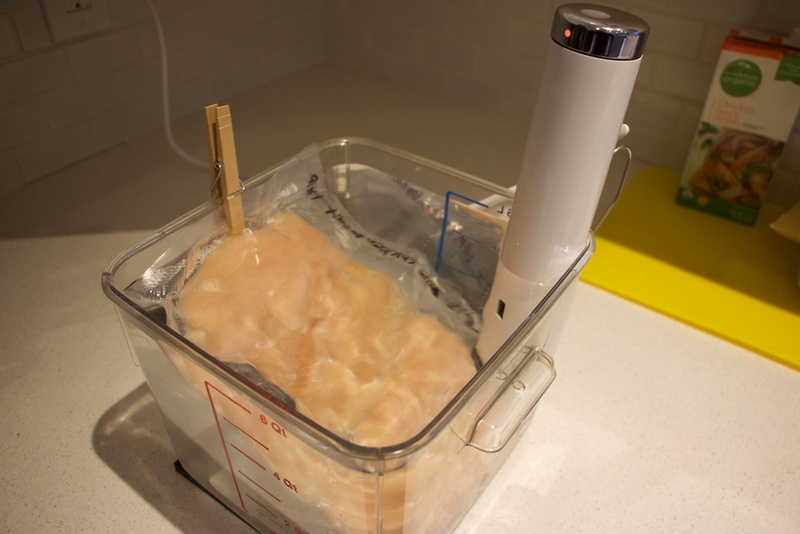 My chicken was already frozen in an airtight foodsaver bag, so I used my Joule sous-vide to cook it in a water bath—using a slow cooker is the next best hands (mostly) off way to get some yummy tender chicken for your soup. I cooled my chicken just long enough for me to be able to hand shred it. When I prepare my veggies, I always like to start by pairing items in prep dishes that will be added to the recipe at the same time. I also like to keep bigger cuts on the veggies in this recipe. I swear the bigger pieces feel more homemade. Again, I would recommend preparing and measuring each ingredient before you do any cooking. The first step is to sweat your vegetables. 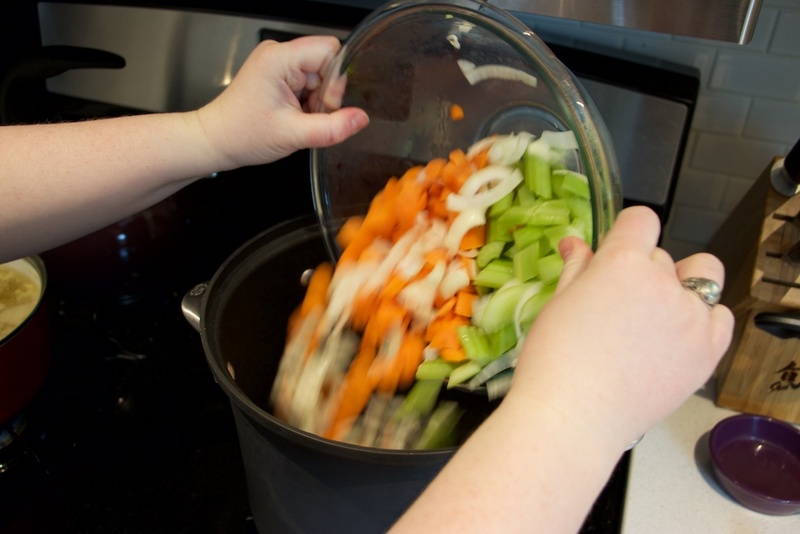 Add your cut carrots, celery, and onion to your stock pot on medium heat. Your goal is to only to sweat the veggies, or start the cooking process by drawing some liquid out of the veggies themself. 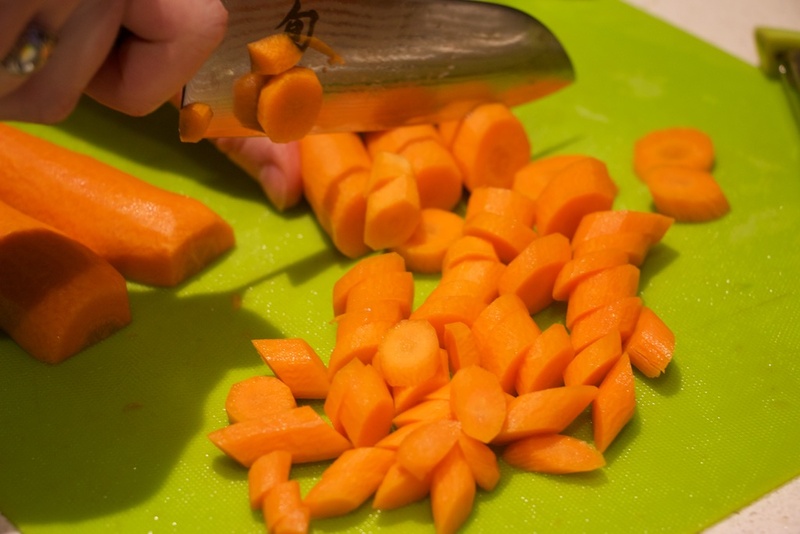 This process will soften your veggies without browning them (as a saute would). I use medium heat and cover the pot to keep the moisture in and stir every few minutes. 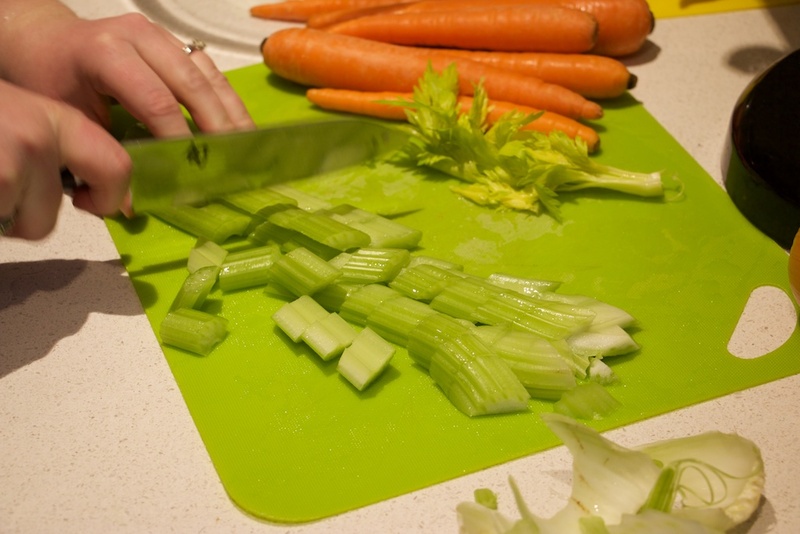 It will probably take you around 10 minutes to soften your vegetables this way, depending on the size pieces you use. You may be surprised to see how much liquid your veggies were storing! 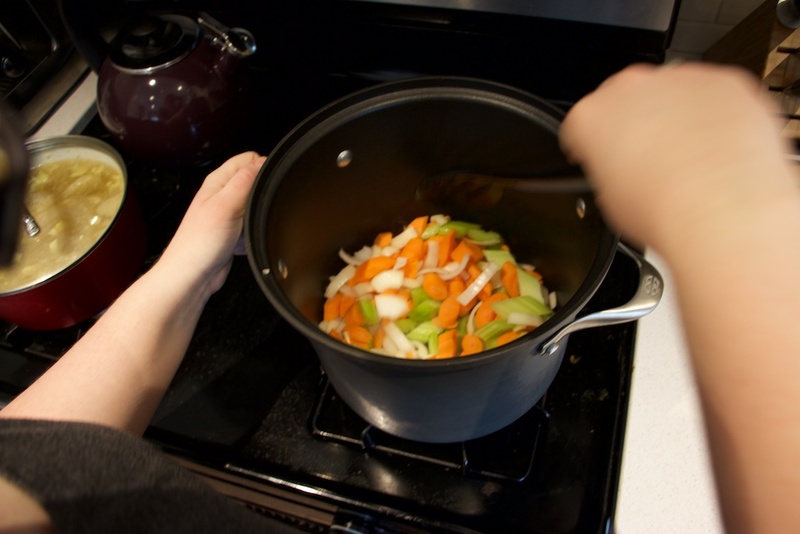 Once your veggies have softened in the pot, you will want to add your garlic to the party! This step will be quick! The pot is already very warm, so stir the garlic in and mix away! We do not want the garlic to burn! 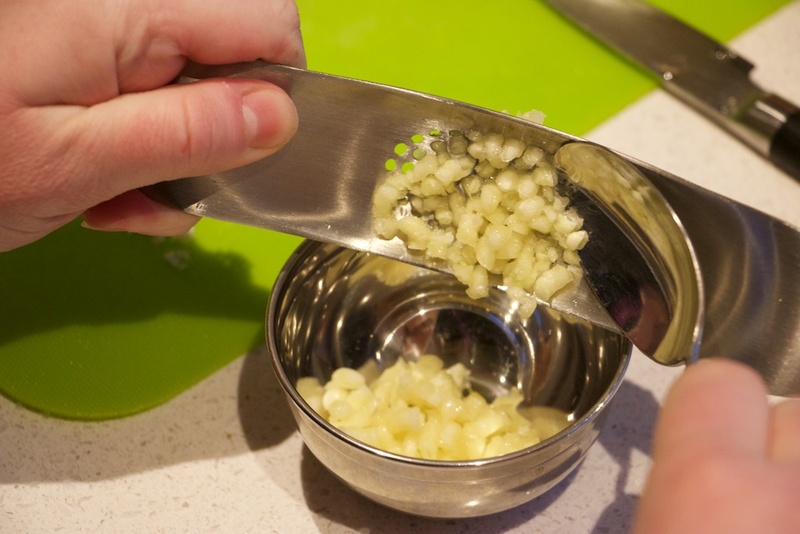 You will want to add in your chicken stock as soon as your garlic becomes aromatic. I typically use both homemade and store bought in my soup, but you can absolutely use all of whichever you prefer (or have on hand). I am adding two quarts of homemade and one quart of store bought stock. I feel I get the best of both worlds this way – a very flavor full fat homemade stock and a lighter yet flavorful low fat stock. This may seem like a lot of liquid at this point but remember we still have to add our chicken and cabbage. 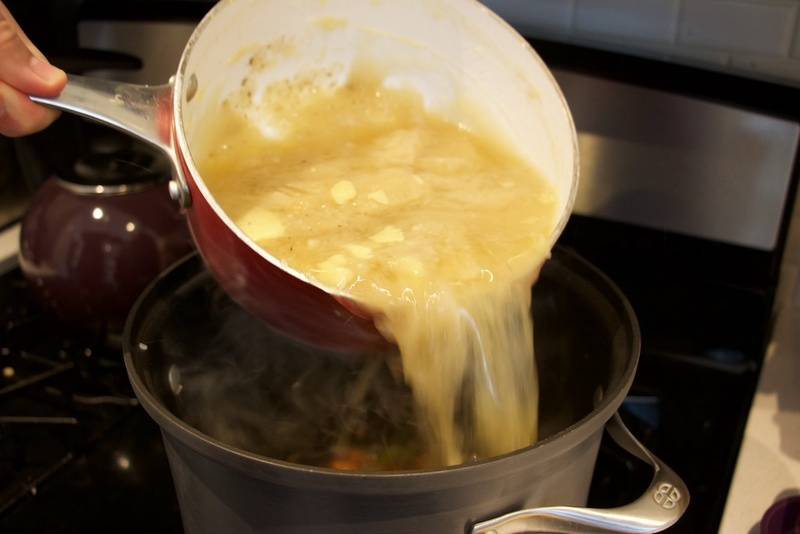 Keep the heat at medium or below from here—a very gentle simmer is the goal. By not allowing the soup to reach any kind of rolling boil you will preserve some of the texture in each of the vegetables. Next we get to add our dry herbs! You should add two dry bay leaves, one teaspoon each of dry thyme and dry rosemary. *I love the way rosemary pairs with chicken so sometimes I add two teaspoons of dry rosemary here for the extra something-something it can add! 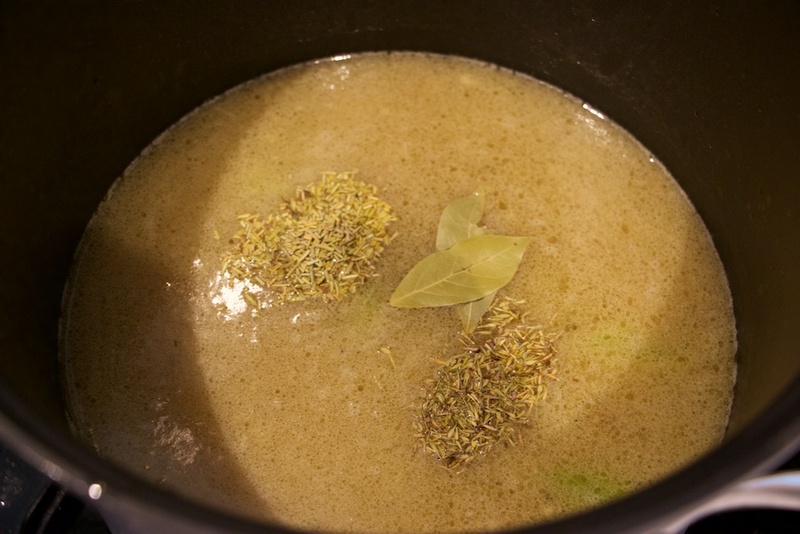 * I like adding the dry herbs while the stock is still warming so they can help infuse flavor into the soup as gently as a tea satchel releases flavor for a bedtime drink. Go ahead and let the herbs infuse for at least 15 minutes. Now that we have infused the herb flavor, we can stir the pot and add your shredded chicken. Your chicken is precooked so it will merely need time to warm thru in the soup. Give everything another good stir to help spread the ever combining combination of flavors. We have done the ‘hurry up’ and now we are in the ‘wait’ stage of this soup. You will want to wait until everything is heated thru and your dry herbs have thoroughly infused and softened in the warm stock. You can test this stage by sampling the broth with some of the floating herbs. Your soup is ready for the cabbage when you no longer notice the herbs as hard bits in the sample. This is about a 30 to 40 minutes time at a very gentle simmer from when you first added the herbs. 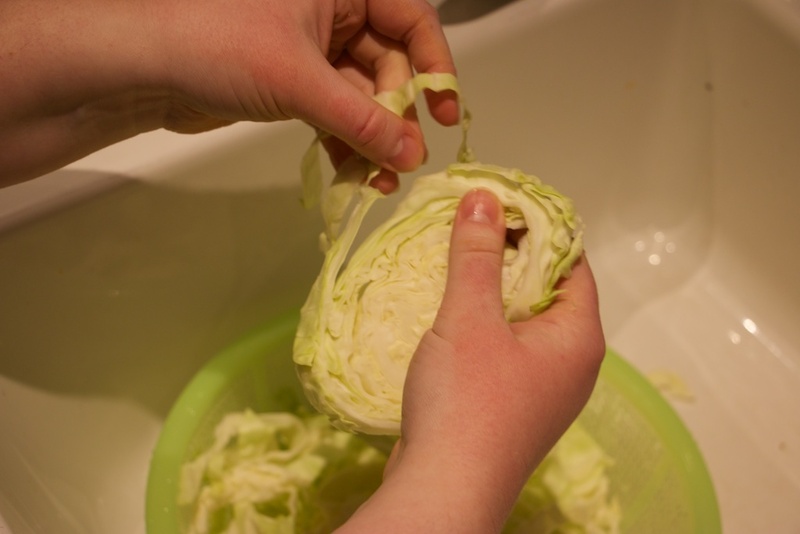 The final ingredient to add is the cabbage ribbons! 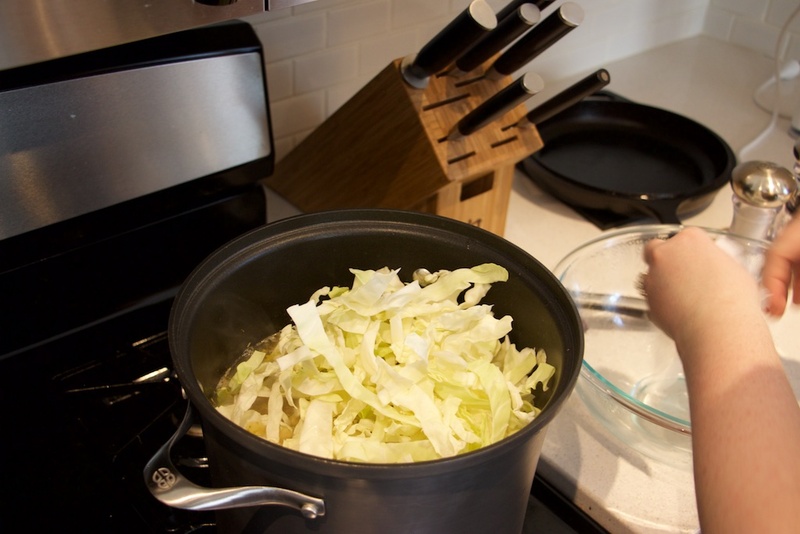 I like to keep a bit of a bite on the cabbage ribbons so I turn the stove off completely and add the cabbage about 10 minutes before I am ready to serve the soup. My cabbage is 1.5 pounds and sliced in thin ribbons as to resemble noodles, hence why I have dubbed the term ‘cabbage noodles’. Add the whole pile of cabbage ribbons at once, then stir to combine the entire concoction. 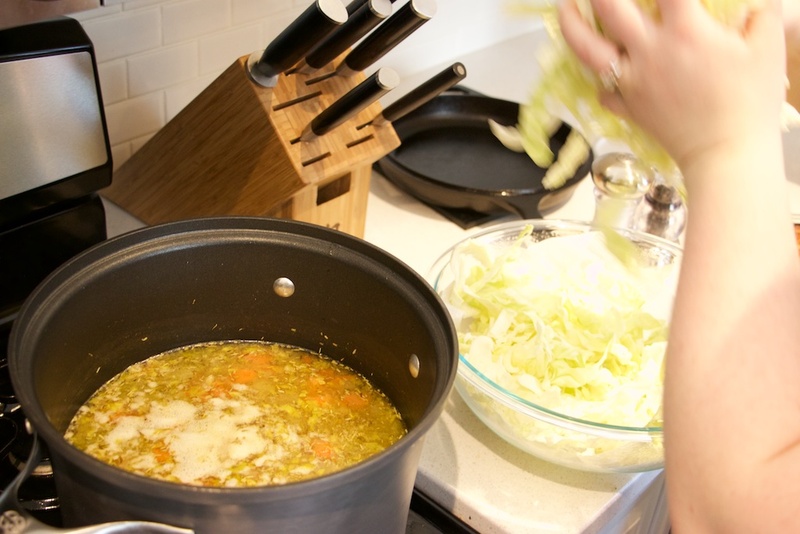 You should see the cabbage quickly brightens up in color as the warm stock gently cooks the cabbage. You may have noticed that I have not yet recommended you add any salt. Because I use a combination of homemade and store bought stock I prefer to wait to add these ingredients at the end of the recipe and salt to taste only if needed. Both stocks already contain salt and I feel that in soup, the flavors change with each ingredient added and as such I feel that adding salt too early can leave to over salted soup which is never a good thing. I hope you enjoy making and eating your Chicken No-Noodle Soup! Please let me know in the comments below! Happy Cooking! 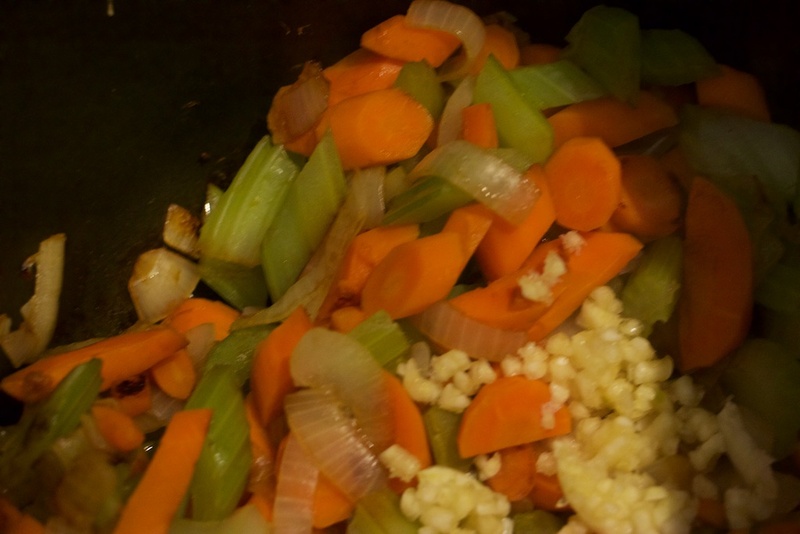 Sweat Carrots, Celery, Onion together in large stock pot on medium heat. Do not brown vegetables. Add garlic once vegetables are softened. Stir. 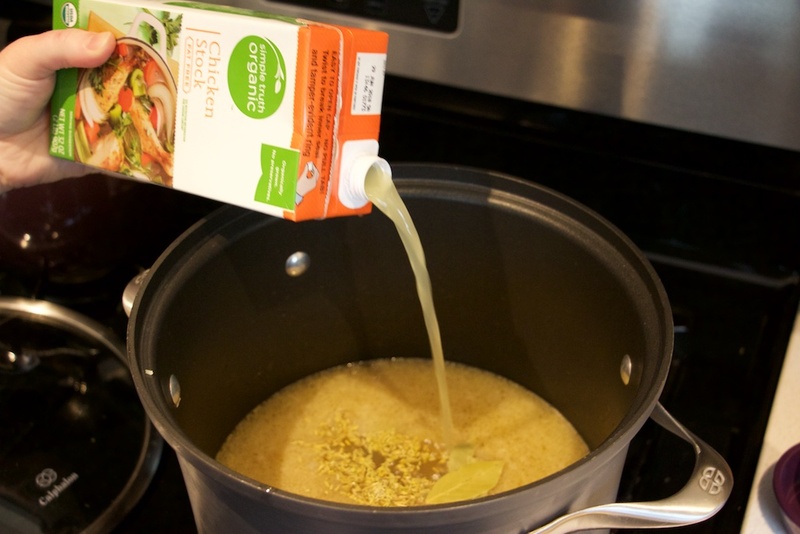 Add chicken stock when garlic becomes aromatic. Add dry Bay, dry Thyme, and dry Rosemary. Allow herbs to infuse in stock for at least 15 minutes. 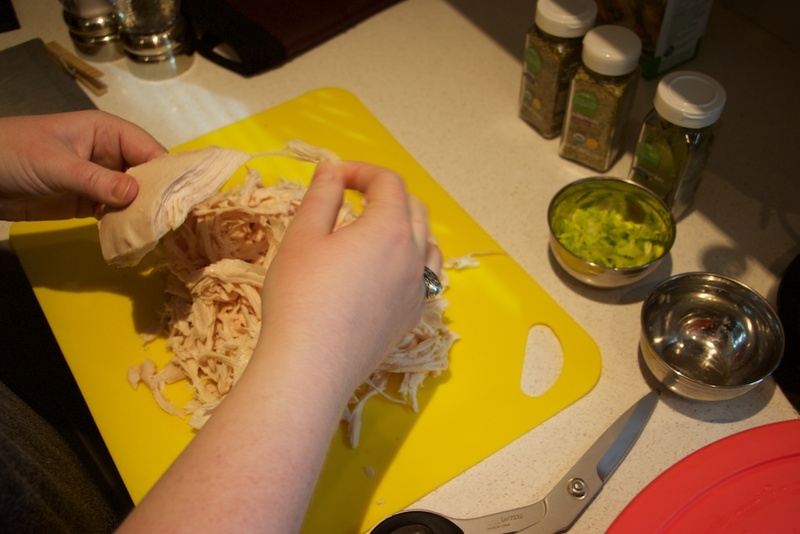 Add shredded cooked chicken. Allow dry herbs to continue infusing until soft as chicken stock warms, about 30 to 40 minutes from herbs having been added. Stir occasionally and do not allow soup to boil. Once herbs are softened, turn off heat and add cabbage ribbons. Stir thoroughly. 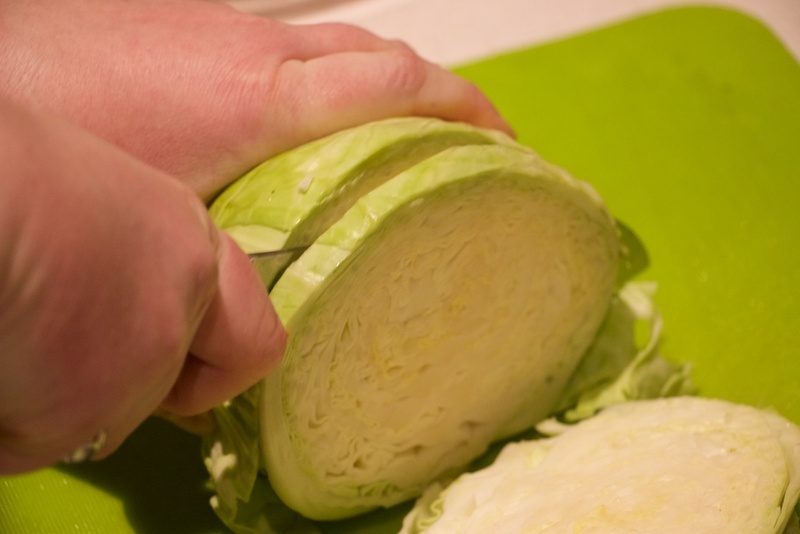 Allow cabbage to soften, about 10 minutes. Taste and season with salt to taste only if needed.